WHAT is the POISSON.DIST Function? The POISSON.DIST function is categorized under Statistical functionsFunctionsList of the most important Excel functions for financial analysts. This cheat sheet covers 100s of functions that are critical to know as an Excel analyst. It will calculate the Poisson probability mass function. As a financial analystFinancial Analyst Job DescriptionSee a real Financial Analyst Job Description including all the skills, experience, and education required to be the successful candidate for the job. Perform financial forecasting, reporting, and operational metrics tracking, analyze financial data, create financial models, POISSON.DIST is useful in forecasting revenue. Also, we can use it to predict the number of events occurring over a specific time, i.e., the number of cars arriving at the mall parking per minute. 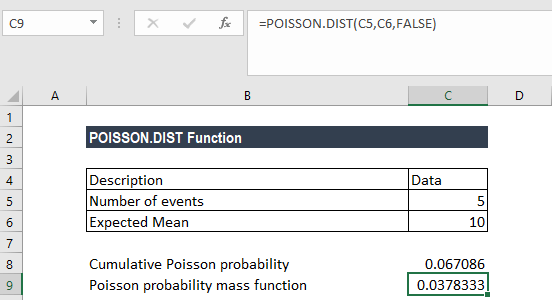 The POISSON.DIST function was introduced in MS Excel 2010 and hence not available in earlier versions. For older versions of MS Excel, we can use the POISSON function. X (required argument) – It is the number of events for which we want to calculate the probability. The value must be greater than or equal to 0. Mean (required argument) – It is the expected number of events. The argument must be greater than or equal to zero. TRUE – It returns the cumulative Poisson probability that the number of random events occurring will be between zero and x inclusive. FALSE – It returns the Poisson probability mass function that the number of events occurring will be exactly x. Where λ is the expected number of occurrences within the specified time period. How to use the POISSON.DIST Function in Excel? The given value of mean is less than zero. #VALUE! error – Occurs when any of the argument provided is non-numeric.